Frontman Matt Harvey comments: "We're very excited to see this record come out. It's been a long time since we've fucked up your stereos! I think this record has a darker vibe than the last two, with a pretty gnarly tale of grave-robbery, dissection, murder, and all sorts of general skullduggery. We dig it and we hope you filthy animals will too." Listen to the new song "Defenders Of The Grave" below and on Bandcamp plus all streaming services. 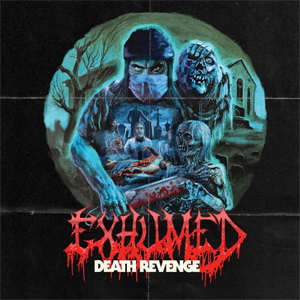 Watch the official Death Revenge album trailer below also. Death Revenge is set for release on October 13th on CD, LP, deluxe LP with cassette, and digital formats via Relapse Records. Physical packages and digital orders are available via Relapse.com and Bandcamp. "The Anatomy Act Of 1832"